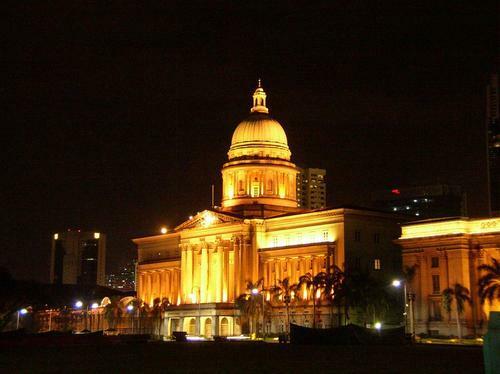 There is nothing magical about our City Hall, but it has played an important role in Singapore’s history. I went on a tour of this magnificent building in year 2008. Erected in 1929, City Hall was originally known as the Municipal Building. It was renamed in 1951. It housed various government bodies before it became home to the Singapore judiciary in 1987. On 14 February 1992, it was gazetted as a National Monument. On 12 September 1945, the Japanese surrendered to the British here, formally ending the Japanese Occupation of Singapore (Feb 1942 - Aug 1945). MM Lee Kuan Yew, our first Prime Minister, proclaimed self-government for Singapore on 5 June 1959 and merger with Malaysia on 16 September 1963 here. The first fully-independent Singapore Government was sworn in at City Hall on 9 August 1965. It was home to the Prime Minister's Office, the Ministry of Foreign Affairs, and the former Ministry of Culture and was occupied by the Supreme Court, the Singapore Academy of Law, the Public Service Commission and the Industrial Arbitration Court. 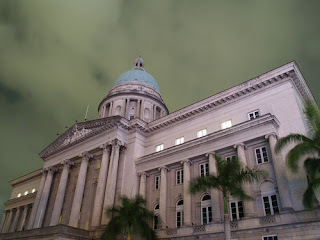 By 2012, the building together with the former Supreme Court Building will be converted to a museum to house Singapore's national art collection. It looks magical to me. Interesting post and wonderful shots. I like the building. Nice architecture! Wow! There's a secret passageway? I like secret passageways! Haha! a beautiful city hall with a great sense of history. I'd love to go back to SG, I miss the relaxing ambience of the place. There may not be much magical about City Hall.but historical buildings are always a treat.